THE WINNER OF THE FABULOUS PRIZE FOR 4 TO EXPERIENCE THE ADVENTURES FROM MOSSEL BAY TO EXTREME BUNGI OFF THE BLOUKRANS RIVER BRIDGE! The WINNER of the Knysna 8 Day Adventure of a lifetime trip for 4 has been won by Katelyn de Schutter. What a wonderful and deserving winner. When called this morning she was so ‘blown away’ and could not comprehend that she won this absolutely fabulous prize! WOW, OH MY, ARE YOU SERIOUS!! I am without all the best words I need, to express my gratitude and excitement. God works in the most powerful and wonderful ways, and have been praying for something life changing! The past year or so has been the most challenging and at times suffering from severe depression, this is not something to be taken lightly, and it has taken some time to be able to be energised in life again! This gifted experience is a once in a life time opportunity and encompasses everything that I love and long to do on a holiday, that wouldn’t normally be within my reach personally at this time in my life! Just to share a personal story – The last time I was in this special area of our beautiful country #proudlySA, I was with my mom and stepdad Chris, he shared the same sense of adventure as I did, and as we watched tiny people bungee off that bridge we giggled thinking how terrified we would be and maybe if we did it together someday….. He is now no longer with us and I am sure I will be as terrified, but will be thinking of that special holiday when I was only 13 – the whole way through this tour! I will keep a journal and share the story with you all! It really is so meant to be – I was in two minds about coming yesterday and in the end decided we would go leaving Church just up the road at Gracepoint; it turned out to be a wonderful afternoon and my daughter enjoyed it too. I wish you many years of success in business coming from this industry I know how challenging things can be at times! Thank you so much to the sponsors and organisers of the event who make dreams come true! I look forward to hearing from the tour operator, and now to think of who will be joining us on this adventure! When asked why I am so passionate about the Outdoor Adventure and Travel Expo after 25 years – this pretty much sums up why I keep looking to finding ways to promote the industry, providing a platform for exhibitors to market and promote their adventures and destinations, and for visitors to have a great time interacting with all who love the outdoors. And it is the many wonderful people and special moments that make it all worthwhile. In keeping up with our proud tradition of being the leaders in the Outdoor Expo arena – we have relooked at what the industry needs, and what the consumer would wish to experience at a fresh new look Outdoor Expo. 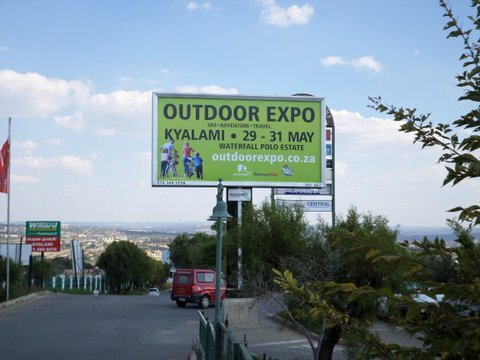 Our first Outdoor Adventure Expo was hosted at the Kyalami Race Track in 1992. The Original Outdoor Expo was a dream of Shirley Shearer to bring the Outdoor Adventure and Travel Industry together under one roof and to provide a platform for Visitors to interact and experience the outdoors. We have enjoyed 24 years of providing over 600 000 consumers, who love the outdoors, an expo to experience what the our Outdoor Exhibitors have on offer, from Travel and Tourism, to Trailers, Caravans, 4×4’s, Boats, Accessories and much more. 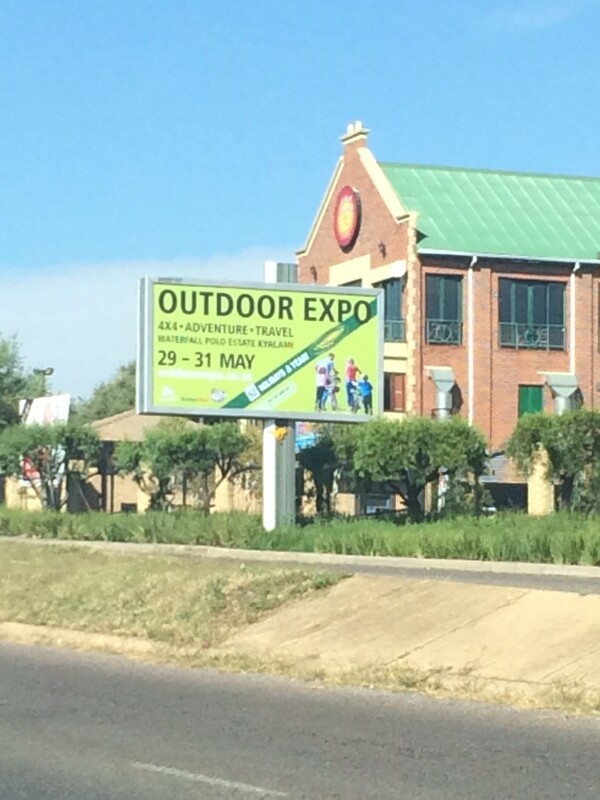 CELEBRATING OUR 25TH ANNUAL OUTDOOR EXPO IN KYALAMI AREA! 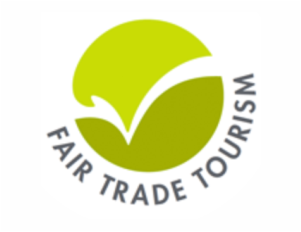 NEW DATES: 27th To 29th October – Summer expo! 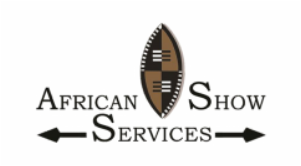 We have moved to the beautiful Inanda Country Base, in the heart of Kyalami, which attracts your target market from Johannesburg North, East, West, South and Pretoria South and East. 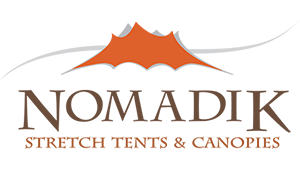 This true outdoor venue will afford Exhibitors from all over South Africa and further afield to promote their Products, Services, Tourism offerings, Adventure Activities, Accessories, and more. Hosted in both Indoor Marquee, and Outdoor Areas to profile their goods to the best advantage. This venue also offers events for the visitors to experience at the Expo. An off road adventure experience either in a test vehicle with an instructor or drive your own 4×4 on the 3 km off-road course, helicopter flights, horse and pony activities, children adventure centre and more! The Adventure Festival Area will feature outdoor seating on lush green lawns, whilst being hosted by a number of good food, craft beer, wine, gin and vodka bars, champagne and oyster offerings and much more. Live entertainment daily, social dogs on leads welcome, bring your camping chair and picnic blanket and enjoy a Full Outdoor Day Out In The Country for the Whole Family and Friends! 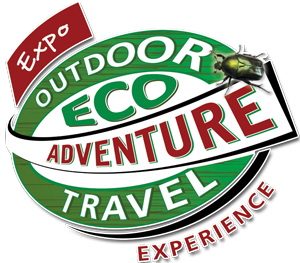 Bring your kids for a fun family day out at this year’s Outdoor Eco Adventure and Travel Expo! We guarantee a world of fun and excitement with the multitude of activities available over the 3 days! Make sure to keep your weekend open from Friday 27th till Sunday 29th of May and bring your kids for some great family fun! Kids can experience something new, like taking them on a camel ride or let them run wild in our hamster balls. They can even experience the art of flying with the exciting Bungee Bounce and Parachute Rocket! Keeping with the theme of our show you can send your kids off on an adventure in our Safari Train or Mini Quads, where they’ll get to explore the adventure trails of the venue! Or let them practice their aim and try a new sport with the Paintballs and Archery. For something a little more toned down and relaxed, let your kids explore their creative side with Pick and Paint and Sandart. You’ll get to enjoy a the taste sensations of the Farmers Market while keeping an eye on the adventure addicts and you’ll get a beautiful, love filled souvenir to take home. And would any party be complete without a Jumping Castle? Certainly not! That’s why we’ve got one, a little extra fun for all ages! There’s of course a choice of sweet treats available too. Mini Donuts, Popcorn, Candy Floss and more! So make sure to try out these mouth-watering delights, because as you know, there’s more than enough activities available to burn that sugar off! Make sure to join us and give your kids a great day out! We’ll see you at the Waterfall Polo Estate in Midrand, on the corner of the R55 and Maxwell Drive. Remember to save the date! The show will be taking place from the 27th to the 29th of May! If you pre book your tickets, kids aged 7 to 18 get in for R20, the normal ticket price being R30. Kids under 7 get in free! With over 200 exhibits from 4x4s, boats, trailers, destinations, camping, activities and more, this expo is the perfect opportunity for a great family day out while planning your next trip! Don’t forget that you can take your own 4×4 on our incredible 4×4 track, or climb the skies in a helicopter. There will also be rugby on the big screen and an amazing collection of food and beverages. 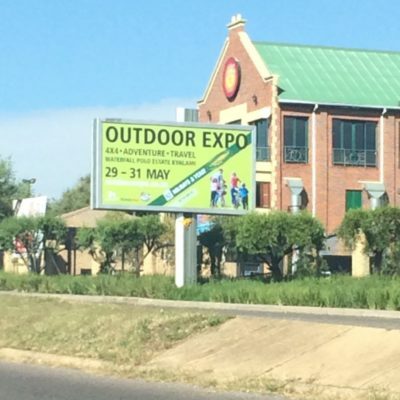 There’s a little something for everyone at the Outdoor Expo, so come and explore with us. We look forward to seeing you and your family at the show! A weekend in the country for the whole family to explore and enjoy! Over 200 exhibits from 4×4’s, Boats, Trailers, Destinations, Activities and more. The Farmers Market and food court will offer you taste sensations, craft beer, wine, cocktails, biltong and Live Entertainment. The Self Drive 4×4 Course is under way and will provide visitors the opportunity to ‘Find The Fun’ on this adventurous track over 1.5km on the estate! 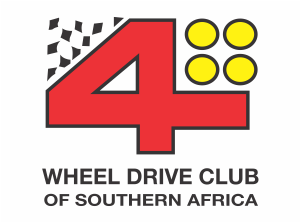 An experienced 4 Wheel Drive Club instructor will be with you to engage the ups and downs! For the Rugby enthusiasts, we want you to join the Big Screen Fixtures on the Gig Rig! From 2.30 pm Saturday 28th May you will be able to book your table of 6 and enjoy time with your mates until 8.00 pm! The Food Court will be open and rugby will be featured. Booking essential. Sunday 29th May 7.00 am– early risers can join our Mass Ride For Cycle Awareness. Entry R75 per person and the whole family are invited to make a stand for cyclists to provide a Safe Environment for all on the roads. Wear Lumo Orange: A bandanna, bib, face paint, or decorate your bike to show your support for Cycle Awareness at the Outdoor Expo. Sunday 29th May features our furry friends Doggy Walk for you and all your mutts. Registration is at 7.30 am with the 2km walk for energetic dogs and owners or 1km walk for smaller dogs starting at 9.00am! All Proceeds to SPCA Midrand. Then join the Sunday festivities at the Outdoor Expo with your social dog on a lead! Enjoy the time with our Key Speakers at the Go Green Corner in the Main Marquee. Talks on Saturday 28th and Sunday 29th: Entry Free. Limited seating so bookings essential! Call our office on 011 8029362 or our website for more on our Speakers and Times. 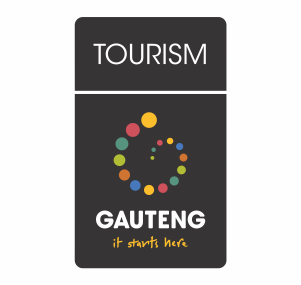 The adventure continues at the 23rd Annual Gauteng Outdoor Eco Adventure and Travel Expo, taking place OUTDOORS at the beautiful Waterfall Polo Estate in the heart of Midrand from 27 to 29 May 2016. Come and explore at our real outdoor venue on the corner of Woodmead Drive (R55) and Maxwell Drive in the New Waterfall Estate (opposite Virgin Active). It’s a weekend of good food and craft beer markets, kids entertainment, music, helicopter flips, camel rides, and so much more. Bring the whole family and view the latest options for local Travel Adventures and Destinations, high tech Caravans, Trailers, 4×4’s, Boats and Accessories! There’s even an off road course, so bring your 4×4 and enjoy the capabilities of your vehicle on the largest 4×4 route – with an experienced instructor on hand! The new Eco feature this year, Project Green will host a speaker’s corner, and a range of topics from Adventurers, Engineers, Practitioners and Mavericks who contribute to the national and global conversation on sustainable living and adventure. A Doggy Walk in aid of SPCA will take place at 8 am on Sunday 29. 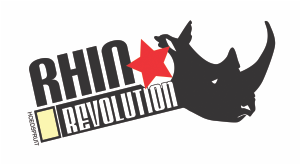 Bring your pooches – and don’t forget to get your dog/s to wear a bandanna to support the cause! Win great prizes for your loveable mutt. 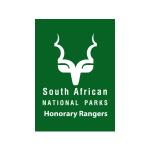 “I was the lucky winner of this competition at the Outdoor Expo held at the Waterfall Polo Estate in May this year. It was an extremely generous prize. 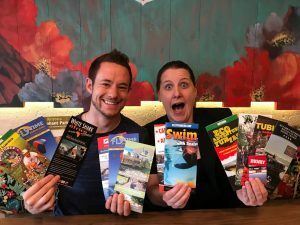 It was for two people and included two nights at the Tuskers B ‘n B at Hartebeespoort, an elephant interaction experience, tickets to the Bush Baby Sanctuary PLUS tickets for a ride up the aerial cableway at Hartebeespoortdam. We – my husband and I – were in the lucky position to be able to take this up during the week, much quieter than over a weekend. We felt very privileged and were spoilt by everyone who was involved. The Tuskers B ‘n B is luxurious, built with care and attention to detail. The gentleman in charge there, Noah, is very helpful and efficient and nothing was too much trouble. The breakfast he cooks and serves really sets one up for the day and is delicious as well! The Bush Baby Sanctuary was very interesting, the monkeys and lemurs are amusing and naughty and the guide, Wyson, was able to answer all our questions – with lots of humour! Taking a ride up the cableway was great fun, the facilities are world-class and the views from the top are really worth seeing. The short walk, which clearly points out the different aspects, is very informative. We enjoyed a tasty pizza at the top as well, whilst gazing out over Africa! Finally – and best of all – the elephant interaction programme. Well, it is FANTASTIC !!! The tour guide that day was Sam – and he excels at his job. He is passionate about elephants and gives a very interesting talk. Furthermore he can answer any question thrown at him and a lot more besides. Getting up close and personal with the elephants was the highlight of it all. Feeding them, walking with them, touching them, getting a muddy kiss and just hugging them ….. amazing!! It was a never-to-be-forgotten day! So sad to think that these gentle giants have an uncertain future in the wild. These elephants all have their own story and are very lucky to be living in safety in their little bit of heaven at the Hartebeesport Elephant Sanctuary. Everyone should take the time to be a tourist in our own country and visit and enjoy facilities like these. We would like to thank everyone involved in this wonderful prize – we thoroughly enjoyed every moment and really appreciated it all. CONGRATULATIONS TO OUR 2015 PRIZE WINNERS! Canoe and Kayak, Wildlife and Exotic Resorts, Earth Bags, Gustos Paella, Vingooo, Qualito, Pink Drive, TorchSA and Vino on Tap. 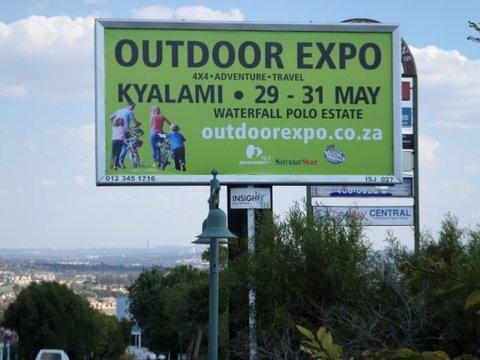 The Outdoor Eco Adventure and Travel Expo brings you another exciting day out in the country in the heart of Kyalami and Waterfall Estates. This is the place to head out for the weekend 29th to 31st May. Over 24 000 square meters of Outdoor and Adventure! Centre, Camel Rides, Bungy Bounce and more! Demo rides on Harley’s (bring your bike license), 4×4’s, and also try out the new and latest crazy MyUniway or an electric bike and more! Get down with your kids and your favorite dog (on a lead) at 07h30 for 08h00 to support the SPCA and enjoy a 1.2 or 2 km Paw Parade walk on the beautiful Waterfall Polo Estate – or bring your bicycle and join the Cycle Ride with Summit Cycles – also in aid of SPCA Midrand. Once the Cycle Ride and Paw Walk are finished, there will be ample opportunity for kids to just enjoy riding the venue and a Paw Parade with lovely prizes for various options of pooch parades! So that’s just the taste of what you are all about to experience….. and did I mention that Harley Davidson will have a mass ride to the Expo on Sunday around 10h30 – now that’s a full family fun experience! Did I say GOOD FOOD? Oh yes, the new Savannah Dark Cider, Cocktail Bar, Craft Beer, Whisky, Liqueur and Wine Tastings, Decadent Sweet Sensations, Best Biltong, and full array of Food Stalls. Special parking facilities for Disabled, Prams and Over 60’s. Look out for our billboards from 1 May!